Big Buck’s received a champion’s welcome as he returned to the Cheltenham winner’s enclosure following a record third successive Ladbrokes World Hurdle victory and 11th consecutive win. Ruby Walsh waited patiently aboard the eight-year-old, a well-backed 10/11 favourite, and saw off Grands Crus to score by a length and three-quarters. Winning trainer Paul Nicholls said: “We were a bit worried about the ground today and the tactics. They weren’t going to go a gallop and we knew what Grands Crus was going to do. We just improvised a little bit today and made sure that he was right. We were always going to be more positive and use our speed and I was worried that there might not be too much pace. “I was nervous because he hasn’t run on that ground and he wins by staying but class is what he’s got and that was awesome today. I made sure he was very fit because I think he used to kid me and have a blow during his races. His class showed going up that hill and you can ride him anyway you like, he’s a real champion. “(Grand Crus’ trainer) David (Pipe) was the first person to shake my hand - he’s a great guy - and the best horse has won on the day. It was an awesome performance from horse and jockey and that was probably a career best from Big Buck’s. “The horse is awesome, it’s hard to explain but he’s brilliant. The cheer he got just showed how much he meant to the crowd. It’s good for racing and he’ll probably go to Aintree now and be back here next year. At 7am this morning he was galloping round the box when my head man Clifford (Baker) went to feed him and he knew he was racing today. Ruby Walsh added: “He’s an aeroplane! What a bad mistake to make to drop my stick halfway to the last hurdle. It was my own fault because I was trying to figure out where they were behind me and only half-watching what I was doing. It was schoolboy-like. “I knew that I had loads of horse left but I knew that it was going to be tactical. The obvious thing for every one to do was to follow me but this horse has grown so much mentally that he no longer needs to be in behind - he can stretch them from the front. “This horse had an entry in the Arkle once and I have always thought that he could run a big race in the Champion Hurdle. We were definitely lucky to get away with it today - it’s not my greatest hour in the saddle, anyway. He is a wonderful horse and he got me out today. “He’s just different and, in a hurdle race, he is as close to unbeatable as you can be. He’s like Cigar or one of those horses on the Flat - he is just incredible. “In fairness to the guys who were riding today, they knew exactly what to do - they decided that they weren’t going quick and they weren’t coming near me. They have got their tactics spot on but he is so bloody good, it doesn’t matter. 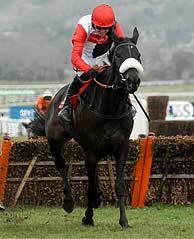 “You are riding a Champion Hurdle or Gold Cup horse in a staying hurdle and he is just an incredible, incredible horse. He is just different. He’s just a wonderful horse and it’s a pleasure to be riding him. “He didn’t have to be at his peak for his last two runs at Newbury but Paul had him spot on today and it will be back to Aintree now. “I dropped my stick going to the last and then I was a bit nervous. He doesn’t want to be racing on his own so I wanted to be middle-ish so I had the option of where to go. I played a waiting game from the front! Those other jockeys are intelligent guys and they weren’t going to just hand the race to me. Geniuses are always quirky and he’s one of those. An epic finish to the Landbrokes World Hurdle saw Grand Crus outbattled by three-time winner Big Buck’s by a length and three-quarters. Jockey Tom Scudamore said: “I’m very proud of the whole team who have worked so hard. We’ve been beaten by a great horse, only one other horse has won three World Hurdles and he’s the first to do three in a row. “The best compliment we can pay Big Buck’s is that he will go home tonight and know he’s had a hard race. Willie Mullins, trainer of third-placed Mourad and Fiveforthree, who finished eighth, said: “I’m delighted with both of them. Mourad’s still only six and that’s young for a stayer. He’ll get stronger and come back next year. A delighted Jennie Candlish, who watched stable star Cross Kennon make much of the running before staying on well for fourth, said: “I’m absolutely thrilled. All I wanted was for him to come back safe and sound - that’s always all that matters - but I’m so pleased that we’re here in the winner’s enclosure for a big race like this. 1. The Ladbrokes World Hurdle is one of the youngest races at The Festival. Known as the Stayers’ Hurdle up to and including 2004, it was only introduced with its current race conditions in 1972. Before that, it was known as the Spa Hurdle. 3. Its first year of sponsorship was 1972, under the title of the Lloyds Bank Hurdle. There have been four sponsors of the race, Waterford Crystal from 1978 to 1990 and Bonusprint from 1991 to 2004. 2005 was the first year of Ladbrokes’ sponsorship and prize money currently stands at £260,000. 4. The Ladbrokes World Hurdle used to be a favourite with the Irish, who have won it nine times, most recently in 1995 with Dorans Pride. Baracouda provided a first success for France in 2002 and followed up in 2003. In 2004 and 2005, he was runner-up behind Iris’s Gift and Inglis Drever respectively, while in 2006 he ran fifth behind My Way De Solzen. Baracouda’s trainer Francois Doumen also saddled Kasbah Bliss to finish second in 2008 and fourth in 2009. 5. In 2008, Inglis Drever created history by becoming the first horse to win the contest three times. He was successful in 2005, missed the 2006 race due to injury before returning to land both the 2007 and 2008 renewals. There have been four dual winners - Crimson Embers (1982 & 1986), Galmoy (1987 & 1988), Baracouda (2002 & 2003) and Big Buck’s (2009 & 2010). 6. Howard Johnson (trainer of Inglis Drever) and the late Fulke Walwyn - with three wins apiece - are the only trainers to have won the contest more than twice. The race was dominated in the mid-1980s by Crimson Embers, trained by Walwyn, and the winner in 1982 and 1986. Indeed, Crimson Embers would have been awarded the race in the stewards’ room in 1985 had his rider not declined to give evidence to the enquiry afterwards, but the trainer won the race anyway with Rose Ravine. The owner, Sally Smart, was ambivalent about the result - she owned both horses! 7. Gaye Chance, the winner in 1984, was a full-brother to the 1983 Champion Hurdle winner Gaye Brief. Both horses were trained by Mercy Rimell. 8. 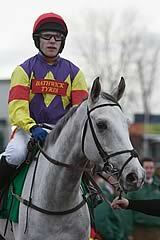 No horse has managed to win both the Stan James Champion Hurdle and the Ladbrokes World Hurdle. 9. A total of 12 favourites have been successful. 10. The smallest field to go to post was eight in 1973 while the largest was 22 in both 1985 and 1990. The current safety limit is 24.